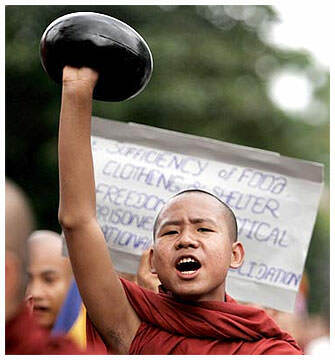 Following dramatic street protests that came frustratingly close to creating enough public momentum to potentially topple the military-authoritarian regime, Burma seems to have returned to the cruel status quo ante of a cowed population suffering ruthless repression. But is the democracy genie truly back in the bottle? Have the oppressed Burmese people nothing to look forward to but more of the same police-state monitoring and intimidation? There is one hopeful sign of possible change. Last week, all 15 UN Security Council members agreed a non-binding UNSC presidential statement on Myanmar. The text 'strongly deplores the use of violence against peaceful demonstrators in Myanmar' and calls on Myanmar's military regime and all other parties concerned 'to work together toward a de-escalation of the situation and a peaceful solution'. This statement is an important benchmark. First, because of its strength and clarity. Second, because it is the first time the UNSC has taken a formal position on Burma; China and Burma having hitherto argued successfully that it is an internal matter outside the council's mandate. Third, because China, the Burmese regime's strongest international protector, endorsed this statement after weeks of negotiating to soften earlier harsher Western drafts. What persuaded China to support such strong criticism of its client regime? The ferocity of the repression, the victimisation of Buddhist monks, the sharp international distress at events, the forthcoming leadership transitions in China, and next year's Olympic Games in Beijing — all may have played a part in inducing China to ease its hitherto implacable position. Now, there can be no going back from the new UNSC benchmark. From now on, the UN will have enhanced leverage to press for dialogue between Aung San Suu Kyi and the military leadership, and for more protection of the human rights of peaceful protesters. Out of this, democratisation can begin to take root in Burma. In some ways, Burma today reminds me of that key moment in Polish history in the mid-1980s, after a bloody suppression of Solidarity strikes in the Gdansk shipyards. Under pressure from a horrified West, the regime agreed to enter into a structured dialogue with Solidarity. Poland moved from iron-fist repression to a softer, more subtle repressive style. Ten years later, an ascendant Solidarity, backed by the Church, negotiated a peaceful transfer of power from a morally bankrupt communist regime. That kind of future is foreseeable in Burma, but it will require years of determined but sensitive diplomacy, not only by the UNSC but also by China and other interested states — most importantly, the ASEANs and other regional countries like Japan, India and, oddly enough, Australia. It seems unlikely the US will have a part to play. China is in no mood to tolerate lectures in democracy from its rival for hegemony and from a power that regularly violates human rights norms in the Middle East. In China's eyes, the US simply does not have moral standing in Burma. The task for regional countries and Australia would be to dialogue with China from a different starting point; one that accepts the major strategic importance of Burma to China. For Burma is a glacis protecting China's vulnerable southern flank. It is also a trade access area to the Indian Ocean (including possible future oil transhipments from friendly Middle Eastern countries, if passage through the Straits of Malacca were ever threatened by a hostile US). And it is a resources-rich hinterland. So for China it is strategically vital that no anti-Chinese regime under US influence ever be established in Burma. Such an outcome is simply not negotiable. What is achievable is a gradual softening of the harder edges of the regime — some dialogue on human rights with opposition elements, more freedom in IT applications, more scope for legal opposition politics, and the acceptance of greater foreign investment to raise employment opportunities and living standards. One is struck by the diversity of China's relationship with bordering states or autonomous regions. These relationships include frankly tributary relationships, like North Korea, Hong Kong, Tibet and Laos. Yet each is very different in character. Then there are non-tributary relationships like Japan, South Korea, Mongolia, Russia, the former Soviet Central Asian republics, Pakistan, India, Nepal, Vietnam … and the troubled relationship with Taiwan. The point is, there is no single model, but many models Burma might aspire to, as a democratic contiguous state that accepts a degree of Chinese hegemony. The trick would be to persuade China that it can both have its cake and eat it in Burma. Perhaps next year Kevin Rudd might help open up Chinese thinking on Burma? He has the expertise and standing to do so. It could be the first example in many years (since the UNTAC settlement in Cambodia) of a successful Australian regional diplomacy involving Chinese interests.